We were very pleased to welcome Mike Frost as our speaker who, although not a professional astronomer, is a self-confessed "eclipse chaser" and Director of the Historical Section of the British Astronomical Association. His day job takes him around the world and gives him the opportunity to visit observatories, as well as viewing astronomical events such as the total solar eclipse that occurred across the continental United States in August 2017. He came to tell us all about his visit to Yerkes (pronounced "YER-kes") Observatory in November 2014, which is a large observatory in Wisconsin that was founded in 1897 by George Ellery Hale, who is best known for his discovery of magnetic fields in sunspots. 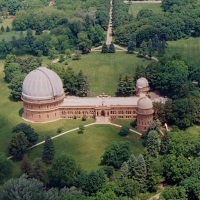 The funds to build the Observatory came from Charles Yerkes, who was a financier involved in developing mass-transit systems in Chicago and London. Mr Frost began by saying that the Observatory is sited in a rural location on the shore of Lake Geneva north-west of Chicago. It has been featured in the film "Chain Reaction" starring Keanu Reeves who played a scientist that had invented a new form of power generation. The Observatory's dome is 90 feet across and houses the largest refracting telescope used for scientific research. The telescope is 63 feet long and its lens has a diameter of 40 inches. To allow such a long telescope to point to high elevations a large section of the floor can actually move up and down. There was a larger telescope built for the Great Paris Exhibition in 1900 but it was so unwieldy it could not be used to make observations, and it was ultimately broken up for scrap with only the lenses now surviving (in storage at the Paris Observatory). Many notable astronomers have used the Yerkes Observatory for their research including Edwin Hubble who used it to study stars for his doctorate. He is famous for discovering that clouds of gas were actually distant galaxies beyond our own Milky Way galaxy. The Hubble Space Telescope is named in his honour. Also, Albert Einstein chose to visit the Observatory for the day rather than going to Niagara Falls when he was working briefly in Chicago. Sadly, the Observatory closed on 1st October 2018 as Chicago University no longer wished to support it. For telescope technology has advanced and astronomers now wish to use much larger mirror-based telescopes at dark sky sites on high mountain peaks. However, its archive of glass photographic plates is still accessible to interested scientists and many educational courses held there have been moved to Chicago University's main campus. He ended his talk by mentioning that whilst in the area he had visited the Alder Planetarium in Chicago as well as the Field Museum of Natural History which has on show the Benld Meteorite. This fell in September 1938 in Illinois and, although only weighing four pounds, it had enough energy due to its speed that it went through a garage roof, a car roof, the car seat, floorboards, then bounced off the exhaust before coming to rest in the seat springs. The museum display also includes parts of the garage and car.